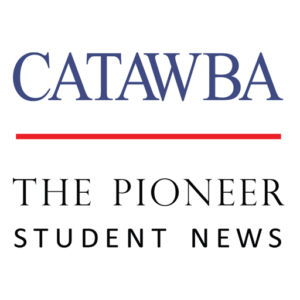 The Pioneer is the student newspaper at Catawba College in Salisbury, North Carolina, an open forum for the exchange of news, information and ideas about life on and around the campus as well as some coverage of national and global issues. Letters and columns (opinion/editorial expression) represent the ideas and beliefs of the individual author submitting material and should not be taken as representative of the entire Pioneer staff. Students at Catawba College manage and maintain the student newspaper under the direction of a faculty advisor through the Communication Department with one credit hour for Applied Journalism available multiple semesters. Most staff members focus on reporting; however, opportunities are also available in editing, photography, design, advertising and other areas. In some cases, students receive additional credit hours for serving in roles requiring more time and advanced skills. Typically, additional hours are credited as practica hours and are reserved for juniors and seniors maintaining solid GPAs. The Pioneer does welcome community input and often features volunteer content from students and other members of the campus community. Please contact us or see the Staff page to contact specific members of The Pioneer team. For those interested in advertising, please see the Advertising page section or under the About Us drop down menu. Other students, however, suggested that students would continue to move forward and would always be pioneers in spirit. In the end, the student newspaper remains the Pioneer. Ironically, the 1926 pilot issue was reviewed by students in the fall of 2009 as the campus newspaper shifted from a print to an online format. It was an interesting time for students to trace the roots of the paper, still as relevant today as it was 105 years ago.